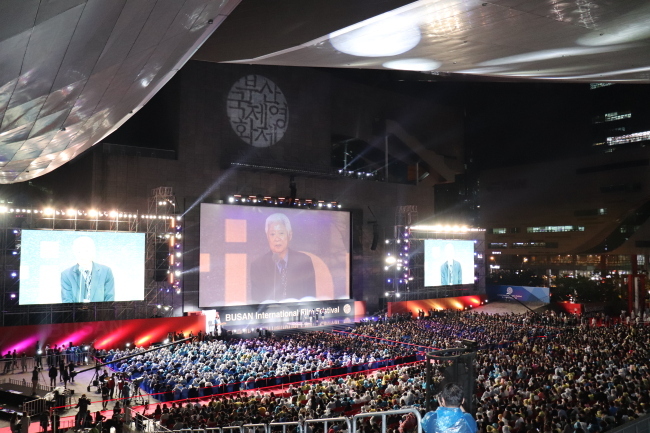 BUSAN -- The 22nd Busan International Film Festival officially opened Thursday evening at the Busan Cinema Center, the mood considerably lighter than last year, when political turmoil and a boycott by Korean filmmakers shadowed the event. Crowds filled the outdoor stage where the opening ceremony took place despite drizzle and wind. The red carpet featured a significantly busier array of celebrities than in 2016, including prominent Korean actors such as Son Ye-jin, Cho Jin-woong and Moon So-ri. “Busan is my hometown. I began my career as an actress (at BIFF) when I attended for ‘Peppermint Candy,’” Moon So-ri said on the red carpet. Moon is attending this year with “The Running Actress,” which she directed, wrote and acts in. BIFF Chairman Kim Dong-ho and Executive Director Kang Soo-youn, who last month announced they would be resigning from their positions after this year, stood at the entrance to the venue, personally greeting each guest on the red carpet. International stars including Japanese actress Yu Aoi and Korean film industry bigwigs such as Son Kyung-sik, president of CJ Group, Korea’s largest contents company, tread the red carpet as well. Hosting the opening ceremony were actor Jang Dong-gun and K-pop singer-turned-actress Im Yoona. The ceremony began by honoring prolific veteran Korean actor Shin Seong-il, for whom a retrospective will run at the festival this year. Shin has appeared in some 506 films throughout his 55-year career. The Asian Filmmaker of the Year award went to Japanese director Seijun Suzuki (“Branded to Kill,” 1967), whose works have ranged from B-movie potboilers to entrancing metaphysical stories. The Kim Ji-seok Award, newly created in honor of the late co-founder of the festival, went to British writer and film festival programmer Tony Rayns. The Korean Cinema Award was received by Christoph Terhechte, head of the Berlin Film Festival Forum who has introduced numerous Korean films to the Berlin fest. The judges, including American director Oliver Stone, were also introduced. Stone is the head juror of BIFF’s signature New Currents competition category, celebrating up-and-coming Asian directors. After the opening ceremony, a screening of the film “The Glass Garden” took place at the outdoor theater. BIFF is set to embark on a 10-day run beginning Thursday, screening some 298 films from 75 countries in 32 screens in and around the Busan Cinema Center, located in Haeundae.